One of the best ways to de-stress after a tough day is to have a good, long soak in the tub. Using Aromatherapy oils can make the experience even more blissful, but until recently I had no idea just how beneficial it is to use them in conjunction with bath salts. Essential oils have a wide range of properties that can help us on a physical, emotional and spiritual level, and combined with the numerous benefits of bath salts you can create an amazingly powerful, therapeutic bath experience in the comfort of your own home! Bath salts, such as Epsom, Himalayan Pink, Hawaiian Red Sea and Dead Sea Salt, are readily available in most health food shops. They are full of minerals and nutrients, such as magnesium, potassium, sodium, bromide and calcium, which your body needs to stay healthy and function correctly. Most of us are deficient in these minerals and nutrients due to the heavily depleted soil our food grows in. Salt baths are notorious for leaving your skin beautifully soft, smooth and supple, however the effects are not just skin deep. Regular salt baths can assist with; water retention, balancing lymphatic fluid and helping the body detoxify, skin conditions such as eczema and psoriasis, muscle aches and pains, fatigue, stress and they can even help strengthen bones. Perhaps one of the loveliest effects of a salt bath is the deeply relaxed feeling you have afterwards. When combined with essential oils, the experience is purely magical. Now bath salts have proudly joined essential oils as must-have items in my home ‘spa’ kit. Making your own Aromatherapy bath salts couldn’t be easier; all you need is some bath salt, essential oils, carrier oil and a nice jar to store your blend in. If you want to take things up a level you can always use a combination of salts, as they all have slightly different colours and textures. Keep in mind though that chunkier salt will take longer to dissolve in the bath, and it isn’t very nice to sit on! Place 3-cups of bath salt in a large mixing bowl and add between 1-2 Tablespoons of carrier oil such as jojoba, sweet almond or grapeseed. Using a spoon, mix the salt and oil together. Add 15-25 drops of your chosen essential oils and once again mix everything together with a spoon. Scoop the mixture out and put into a jar that is airtight. If air gets into your Aroma bath salts, the scent won’t last as long. 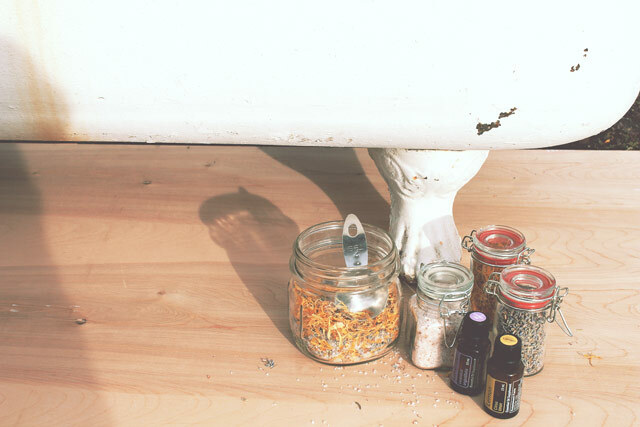 Give the jar a good shake before adding between ½ -1 cup of the Aromatherapy salts to your bath. To avoid the essential oils evaporating more quickly, add the mix once you have finished running the tap, but make sure the salt has dissolved enough first before you get in. The beauty of using essential oils is that you can create a personal ‘bath salt’ blend, to promote sleep, boost energy, soothe sore muscles, calm eczema flare-ups or simply regain a sense of calm. The choice is yours! Below are some examples of Aromatherapy Bath Salt recipes, but feel free to make your own using scents you enjoy. Just remember to take the necessary precautions when using essential oils, if you have any health conditions please speak with your GP and a qualified Aromatherapist first. Each recipe will make enough for between 3-6 baths. Use whichever bath salts you feel drawn to but I personally like using Epsom, Dead Sea and Pink Himalayan. The same goes with the carrier oils, but jojoba is intensely nourishing for the skin so is a great choice if you have dry skin, eczema or psoriasis. Mix 1-Tablespoon sweet almond carrier oil in 3-cups of bath salt. Add 10-drops marjoram, 6-drops lavender and 6-drops roman chamomile and blend well. Mix 1-Tablespoon sweet almond carrier oil in 3-cups of bath salt. Add 9-drops clary sage, 6-drops lavender, 6-drops frankincense and 3-drops orange and blend well. Ideally use about 1-hour before bedtime. Mix 1-Tablespoon sweet almond carrier oil in 3-cups of bath salt. Add 6-drops neroli, 6-drops petitgrain, 6-drops lavender and 3-drops orange and blend well. Ideally use about 1-hour before bedtime. Mix 1 ½ -Tablespoons grapeseed carrier oil in 3-cups of bath salt. Add 9-drops rosemary, 6-drops peppermint and 3-drops orange and blend well. Use a bit more carrier oil in this blend, as peppermint is a skin sensitizer so it’s important to dilute it more than you would other essential oils. Mix 1-Tablespoon sweet almond carrier oil in 3-cups of bath salt. Add 9-drops vetiver, 9-drops jasmine and 6-drops ylang ylang and blend well. Vetiver is known as the ‘oil of tranquility’ so this is a great blend to use when you need some ‘me time’. Mix 1-Tablespoon sweet almond carrier oil in 3-cups of bath salt. Add 6-drops ylang ylang, 6-drops neroli, 6-drops jasmine and 6-drops rose and blend well. For a more masculine blend add 9-drops sandalwood, 6-drops patchouli and 6-drops orange and blend well. Chocolates and champagne are optional! Mix 1-Tablespoon jojoba carrier oil in 3-cups of bath salt. Add 10-drops roman chamomile, 6-drops neroli, 6-drops lavender and 3-drops geranium and blend well. Mix 1-Tablespoon sweet almond carrier oil in 3-cups of bath salt. Add 9-drops ravensara, 6-drops tea tree and 6-drops lavender and blend well. Ideally use this blend at the first sign of a cold or if you’re feeling particularly run down. If you don’t have a bath, don’t feel left out! 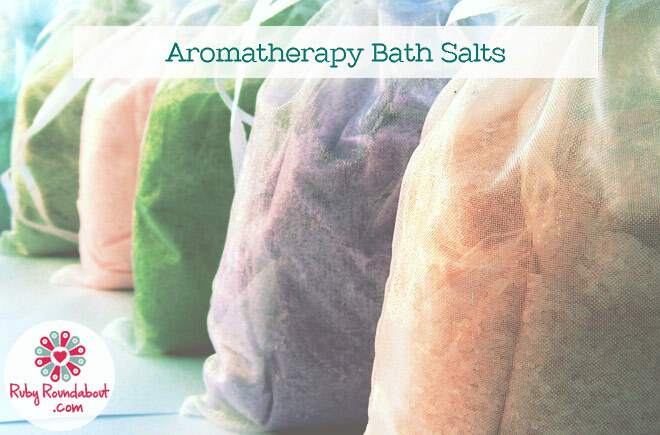 Even with a shower you can still enjoy the benefits of these Aroma bath salts! Simply rub the salt blend into your skin before getting into the shower. Not only is it a great way to exfoliate your skin, but you will still get the benefits of the oils and minerals too!